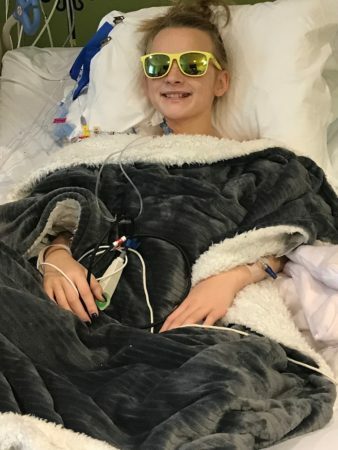 Attie Jamison, 14, remembers having pancreatitis attacks since she was 4 or 5, but her parents feel that she actually had attacks even before she could form sentences. “When Attie was 2, she would have unexplainable tummy pains, screaming in pain. We would drive to the ER and then maybe it would pass so we never had her checked out at the hospital prior to her pre-kindergarten year of school. Her teacher contacted us and said that she keeps complaining of her chest hurting, and that they might be chest pains. 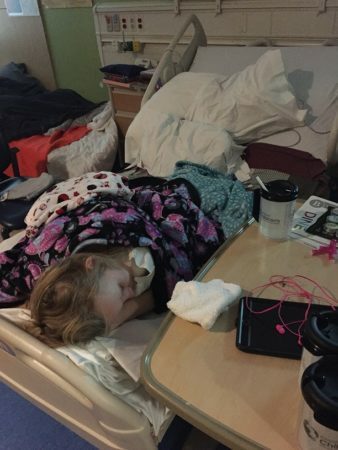 That’s when we took her for blood work immediately,” said her Mom, Jenny Jamison. They share Attie’s journey with pancreatitis, her TPIAT surgery, and what life is like for Attie now. Attie has always put herself in many positions to find relief from pain. With the attacks, what did you think it was initially? Attie: My father and grandmother were both diagnosed with pancreatitis so we have always suspected it. **Attie’s dad observed her that school day through a window and paid attention to her behavior. It was familiar to him because he has also suffered from pancreatitis his whole life. When he saw her walk across the room hunched over like an 80-year-old, he was certain what we would find. Did your doctors know it was pancreatitis right away? Attie: Yes and no, my dad thought that I had pancreatitis so he asked doctors to test for it. **We went to our family doctor and requested an amylase and lipase count be done on her. Due to the family history, there was no trouble getting this done. Her counts were off the charts. They told us she had a very sick pancreas. How often were your hospital stays? Attie: I was normally in the hospital 2-4 times a year usually in the summer. But the year leading up to my surgery I was hospitalized 5 times. Headed back into surgery after the TPIAT to break up the clot in her liver. Attie: I do not know or remember because I started having attacks at two years old, possibly even before then. **This has always been the life she knows. What was your life like living with pancreatitis attacks? What did you have to do differently to work around this illness? Attie: While having an attack I tried my best to keep life the same as normal, but sometimes it was impossible to do that. The biggest thing to “prevent” that happening was to control my diet and not over work myself by getting too tired. **Attie was mostly affected by pancreatitis in her extra-curricular activities. She would have to miss rehearsals or competitions. She would tough out performances then head to the hospital, or leave the hospital and try to push through a performance. She would miss a week of dance classes. One time she missed an audition because she just couldn’t make it any more. She showed up and danced the first part, but then had to pull from the audition because she couldn’t finish. She refused to let it get in the way of the things that were important to her, but sometimes, it was just too much. Her teachers were always so good to help her get through attacks. She would find comfortable positions or take breaks where she could lay down, but still listen to instruction. One of the hardest things for Attie was the need to stop eating during an attack. She was fine with our routine and ways to control the pain, but she has three siblings who still needed to eat. It was so “unfair”. She would make lists of foods she wanted to eat when she was done with the attack. Grit and Grace. Attie pushes through with grit so she would be back to dancing with grace. What was the main factor in the TPIAT surgery? Attie: One of the things that most convinced me to have this surgery was the idea of never being hospitalized or being in pain. Before having a TPIAT, I’ve never had surgery. **Because Attie’s father had a procedure at 20 and 21, we knew she would eventually have surgery to try to correct the malformation. We never dreamed we would remove her pancreas. In June of 2017, Attie was extremely sick. Her liver wasn’t functioning due to blockages and pancreatic stones. This was terrifying to us because it was unfamiliar to us all, including the physicians. However, our pediatric GI had heard Dr. Jaimie Nathan speak on a TPIAT conference she attended and referred us to Cincinnati Children’s Hospital. After researching the criteria for this surgery, I knew Attie was a good candidate. It was frightening and exciting at the same time. The deciding factor for us as her parents was that we can control diabetes should we be faced with that, but pancreatitis was controlling and affecting all areas of our lives. She also has the PRSS1 gene. What was your recovery like after your TPIAT surgery? Attie: Recovery was difficult but it is extremely worth it even two months post op I could already see what was ahead and how great it would be to live a pain free, hospital free life. **Recovery was intense. It was terrifying, exciting, amazing, frightening, harder and better than we ever expected. Attie had a clot in her liver a few days after the TPIAT and she had to undergo a second surgery to fix this challenge. They used a clot-busting agent and the vein began to function normally. 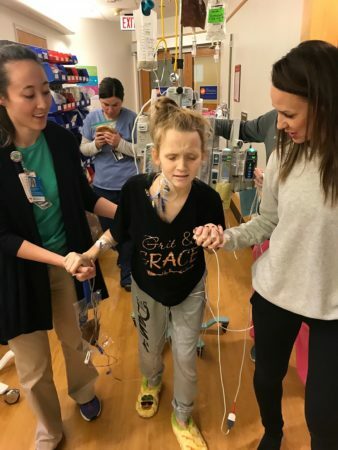 She spent some extra time in ICU and that took a toll on her, but the medical teams were amazing and she soon was walking and moving with confidence and strength. For months, Attie gave herself shots for the blood thinner. She took so many meds! She kept a feeding tube for months, even though it made her sick to take any nutrition through it, it all needed time to heal. She danced in one of her competitions with the feeding tube tucked up inside of her costume. Nothing was going to stop her! She also has a lovely scar that runs up her midsection. Attie should have had an insulin pump for the first year after surgery to give her islet cells time to recover and begin creating insulin. However, after we returned home from the surgery, Attie would crash every time she was dosed for the food she ate. So, we cut back on her insulin, until finally the endocrinologist suggested we pull the pump and stop giving her insulin. This meant the islet cells were producing insulin in their new house, the liver. This was amazing and exciting and miraculous! One year post-op, Attie is only on Creon, which will be a lifelong commitment (and baby aspirin). 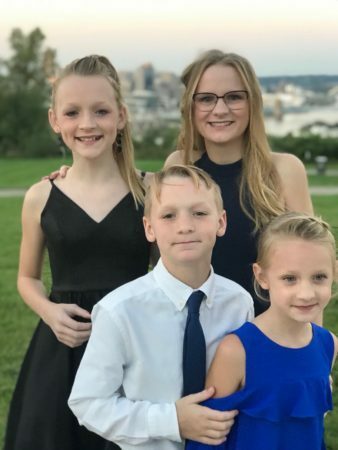 Attie and her siblings Gracie, Luke, and Ainsleigh at the Cincinnati gala. Her siblings have supported Attie in all things as she battled pancreatitis. Any illness will take a toll on you mentally and physically. For kids that are living with pancreatitis as well, what piece(s) of advice would you tell them to help them get through this? Attie: Any time you’re having an attack find something to distract yourself, like reading, telling a story, playing a game, focus on everything that’s good and fun. I also pray, have people pray for you. **Once Attie would start having less pain, but was still too sick to eat she would really struggle. She would begin saying, “I’m hungry” “It’s not fair!” We would always agree with her and tell her that God doesn’t give us what is fair, but what is good for Him. We also assured Attie she was made exactly the way she was supposed to be made, junky pancreas and all, because the junky pancreas made her faith stronger, her perseverance more intense and her determination and passion for others unmatched. We would tell her to list 5 things that are beautiful, 5 things that are amazing, 5 places she wants to travel. We called it “Operation: Distract Attie”. We would get her new Lego sets to construct or Play-Doh, anything she could do with her hands and mind to keep her from focusing on how long she had gone without food. As she got older, we brought her make-up so she could do my makeup or anyone who happened to visit. There were no visitors who weren’t considered in need of a makeover. For you personally, what has helped you the most during this ordeal? Attie: I would always make a list of foods I wanted to eat as soon as I got out of the hospital. After the TPIAT, I set a goal of attending a party with my church and dancing in the competitions with my dance troupe. Setting those goals and knowing that I had to do the work to get to those things, motivated me to get moving and get back to my life. I never wanted to miss anything! **Having doctors who listened to us and trusted us, helped us to get the right care at the right time for Attie all throughout her journey with pancreatitis. We are so grateful for the whole medical team that has played a part in getting Attie on the road to a healthy, fulfilled life. Attie as Clara in the “Nutcracker”. Attie has always been very active, rather it was dance or gymnastics, she competed and excelled at whatever she chose to do. She may have missed rehearsals, practices, auditions, etc, but she never gave up. She would ask the judges or coaches if she could come back the following week when she was well to try again. She never settled or used the excuse that she was sick to get out of something, rather it was an inconvenience she would try to find a solution for. How is your life now post-TPIAT? Attie: I am 1 year post-TPIAT and my life has never been better, I have been to Disney World, banquets, and spoken at various events. This surgery was by far one of the best things to ever happen to me, yes it was hard, and yes it hurt, but it was so worth it. How long have you been doing ballet? How did your Nutcracker performance go? Attie: I have been dancing for four years now. Nutcracker went amazing, every show was perfect, and what’s even better, I never got tired or had an attack. I plan to keep dancing in high school and in college, maybe even professionally. How did you and your family learn about the National Pancreas Foundation? **As we were researching prior to the surgery, we found your web page. After scrolling some on Cincinnati Children’s Facebook page, discovered the Ohio/Kentucky NPF Chapter. Attie was honored to be the Courage Award Recipient in 2018 at the Party for a Cure – Cincinnati gala. 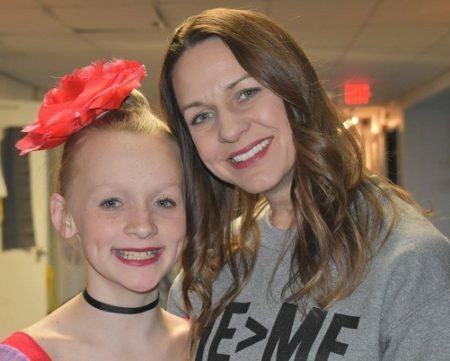 We are so proud to tell about our experiences at Cincinnati Children’s and the difference their team and the research provided by NPF efforts has made in Attie’s life, but our whole family’s life as well. We no longer have to miss out on experiences due to hospital stays. Our life has been made better because of NPF’s efforts and work. We will forever be grateful for the work of the NPF. Attie speaking at the NPF Cincinnati Party for a Cure gala and her super-hero family!